Team Vehicles - mainly worked with John Van Den Eynde on the FWD, trying to separate the chassis from the rear axle and suspension. A great deal of heat, pressure, sweat, oil and creative language was employed. 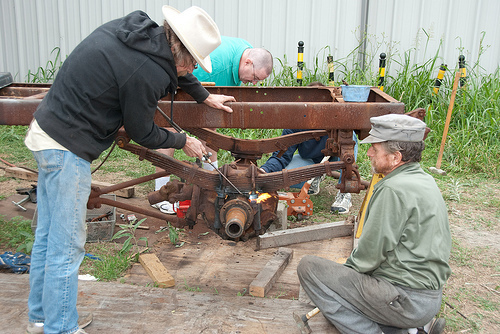 The team made progress and freed one side of the axle but the other proved a bit more stubborn. 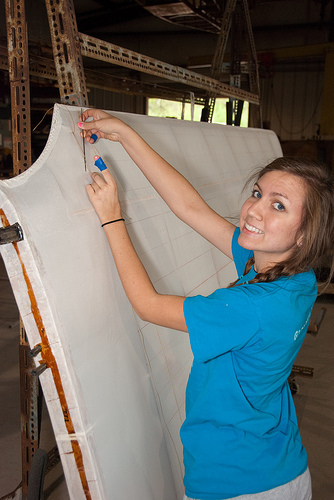 Team Tommy - repairs to one of the T-2 wings were completed, and the T-2 ailerons were started on their journey to cover. Cheesecloth was obtained to cover some leading edges, but the weather was deemed too cold for the glue. No cheesecloth was actually applied. The main progress to report here was that another T-1 wing was rib stitched and is ready for tapes! The T-2 ailerons needed some minor repairs to the ribs and gussets prior to varnishing the wood, so Team Tommy formed up to replace a capstrip and clean up the remaining problems. Team D.VII - Roger had visitors during the day, one of whom is an engine expert. The D.VII Gipsy Queen was re-assembled and several engine test runs were made. I confess I don't know what the outcome was. The engine sounds great and seemed to run well once the oil scavenging system was primed and the connections tightened down! Team Clean-Up - several volunteers spent part of the day mowing and getting dirty spider webs down off the hanger walls. Makes quite a difference in the appearance of the place!